Additional shipping charges may apply for HAWAII customers. 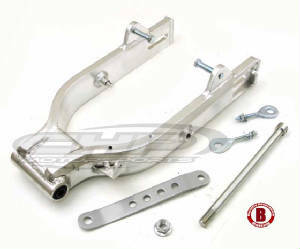 Swing arm, Aluminum, Braced. Stock length, nice construction incorporating the rubber and steel sleeve bushings. 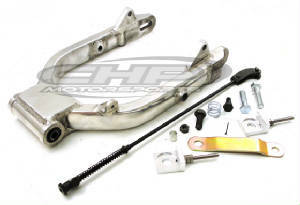 Kit includes swing arm, rear brake strut and spacer, rear axle with rear wheel adjusters and locking nut as well as lower rear shock mounting bolts. 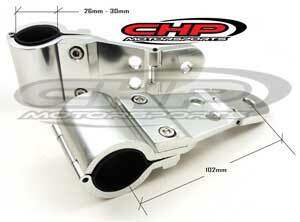 CT70 Aluminum swing arm. Nice aluminum construction. 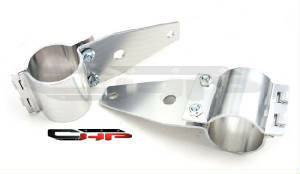 Comes with the stock bushings that are used on the original swing arm design. longer rear axle and locking nut and rear wheel adjusters. 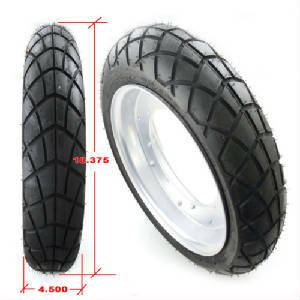 2" longer than stock to provide the longer wheel base needed for more stability for higher speeds. Knob Set, Handle Bar, Billet. Add that custom look to your CT70. Billet Aluminum Knobs with machined and counter sunk steal threaded anchor bolt. 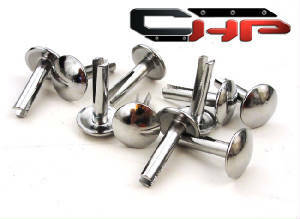 Simply unscrew your stock knobs and screw these on. Grab Bar for frame. 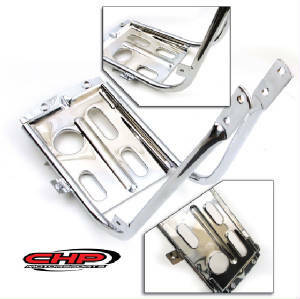 CHP Motorsports has now improved on the Honda design and now offers our heavier gauge construction as well as TRIPLE PLATE chrome, nicer and stronger than Honda at less expensive price. This handle gives a nice handle for loading or just moving the CT70 around with out grabbing the seat pan and then breaking the pan. 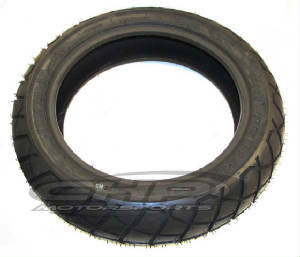 These were standard issue on the ST70 over-seas. 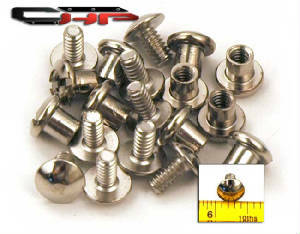 Bolts into existing frame mounting holes in your bike with 6mm bolts. Fender, Front after-market. 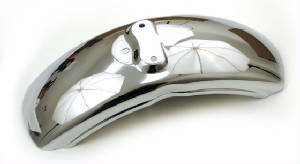 Reproduction fender, triple plate chrome and heavy duty construction. Nice alternative to the OEM Honda fender. The plating is nice than the Honda and has the same rolled bead on the sides and front lip. Spark Plug Guard, NEW Absolutely beautiful reproduction. 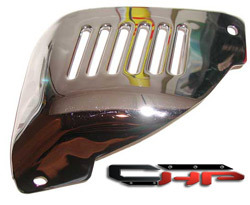 You can not have your old guard rechromed for the cost of this new item. Luggage Racks *. Heavy gauge construction as well as chrome plating Our luggage racks are reproduced exactly like the originals and will fit on all models with out blinkers, KO through K3. 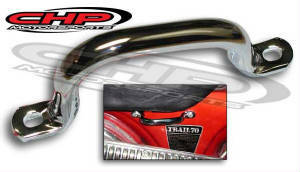 This is a very nice re-production of the original Honda CT70 KO taillight bracket. 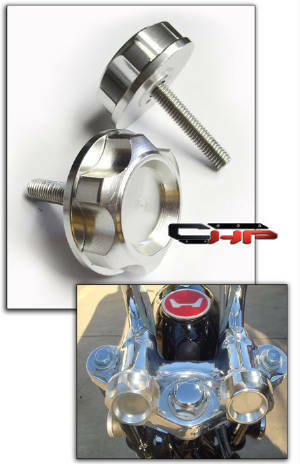 This item is completely new out of new tooling and is not a taillight bracket off of another bike, made to fit your CT70 KO. You can not re-chrome your original bracket for the price of this item. Finished off with very nice triple plate chrome with small signs of the spot welds just like the original Honda bracket, ready to bolt on and go to finish your restoration. 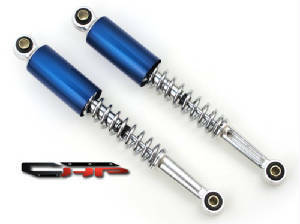 Shocks(1 SET), Rear CANDY SAPPHIRE BLUE with upper cap color matched to your original CT70 KO color. 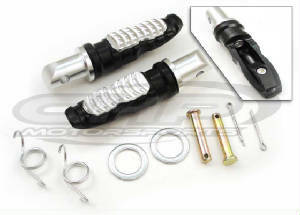 We have these rear shocks reproduced and updated a bit for a more improved ride, improved valving as well as a little higher spring rate, better suited for the adult rider. Striking similar to your original equipment, bolt on and go. 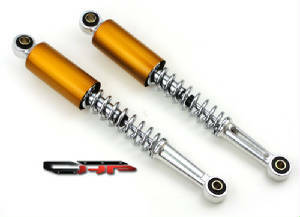 Shocks(1 SET), Rear CANDY GOLD with upper cap color matched to your original CT70 KO color. 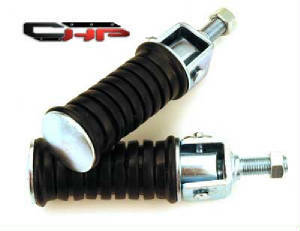 We have these rear shocks reproduced and updated a bit for a more improved ride, improved valving as well as a little higher spring rate, better suited for the adult rider. Striking similar to your original equipment, bolt on and go. 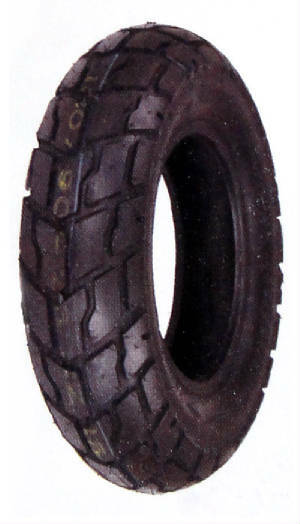 Shocks(1 SET), Rear CANDY RUBY RED with upper cap color matched to your original CT70 KO color. 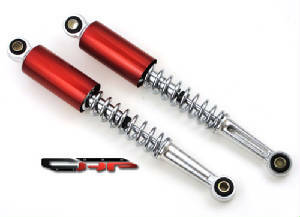 We have these rear shocks reproduced and updated a bit for a more improved ride, improved valving as well as a little higher spring rate, better suited for the adult rider. Striking similar to your original equipment, bolt on and go. 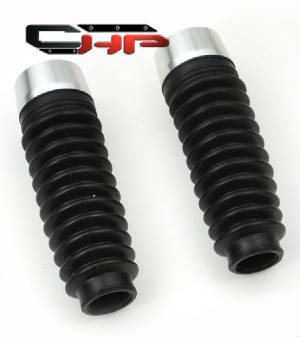 Shock set, Rear, 330mm (13.00") Gas Piggy Back shocks. Adjustable re-load settings as well as damping. Heavy duty construction designer for the adult rider. 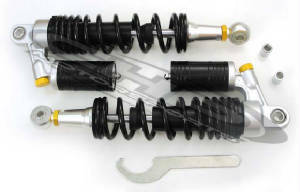 If you are looking for a performance set of rear shocks these are the best units that we have run across for the cost. 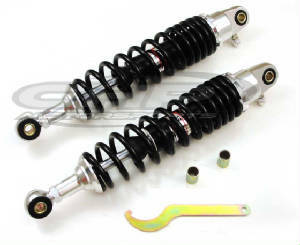 Shock set, Rear, 330mm (13.00") Gas Piggy Back shocks. Adjustable re-load settings as well as damping. Heavy duty construction designer for the adult rider. Adjustable re-load settings. 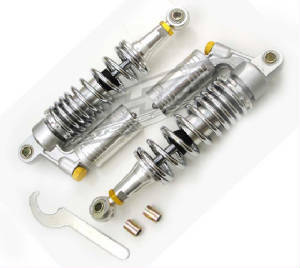 A very high quality designed and built JAPANESE shock set. 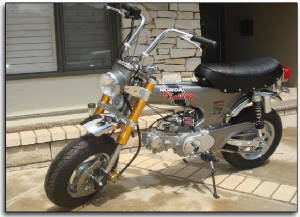 HONDA CT70 KO FORK EXTENSIONS, FORK LEGS. These NEW Reproduction fork extensions are absolutely beautiful with triple chrome plating. These are not a fork extension found on a Chinese copy cat bike; these are NEW from our own tooling and are much nicer than the original Honda Fork extensions. 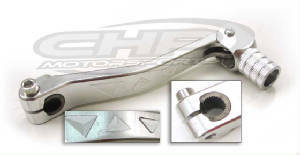 We had these fork legs manufactured from 4140 HT material , more than 4 times stronger than the original legs were as well as TRIPLE PLATE CHROME , much nicer than the FLASH CHROME PLATE that Honda had on the originals. 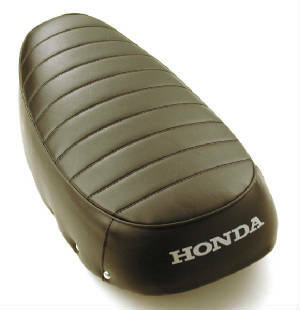 This item has been discontinued from Honda for more than 25 years, so now you can purchase this new set for less than it would cost to re-chrome plate one leg. No more bent fork extension and sticking front end, brand new and beautiful. 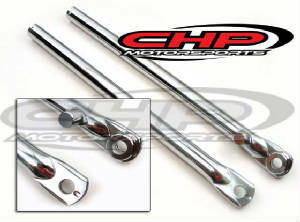 As always with CHP Motorsports products, satisfaction guaranteed. 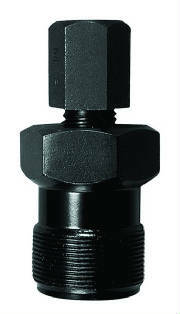 P948 Triple Clamp with Knobs. Heavy duty construction, Billet Aluminum with Billet aluminum knobs. Precision made clamp with removable bar mounts. this is the missing link that you would need. The mounting parameters are listed in the picture. Hydraulic front Suspension. 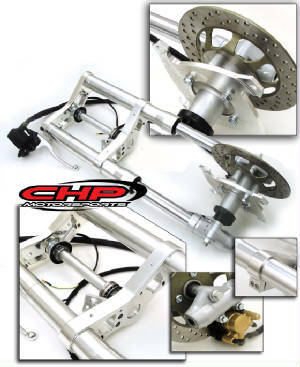 Inverted front forks, billet aluminum triple clamps, billet aluminum front hub for your stock 10" CT70 rims as well as a speed-o drive with speed cable and Hydraulic front brake assy. This unit will also come with a steering bearing upgrade to give that bike bike feel. 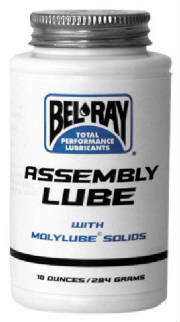 Unit will come with shipping oil installed and will require additional oil to operate properly. 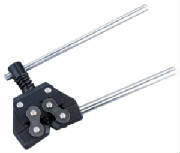 The top triple clamps comes ready for use with conventional handle bars or can be modified to work with the stock fold down CT70 bars and stock front CT70 fender. The front in shown in the picture was installed by Darrel Gunderson on one of his custom creations with a modified CT70 K1 handle bar holder to adapt to the top mount to retain that vintage look. 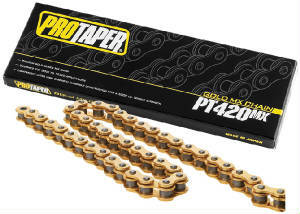 If you are after a nice performance up-grade for your stock suspension, this is the nicest that we have run across. Very heavy duty construction , nice ride and feel as well as handling and a brake that will stop you on a dime. 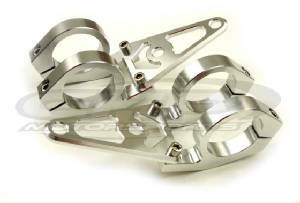 Headlight brackets for 43mm - 44mm. Light weight construction and inexpensive. Aluminum construction cost effective. 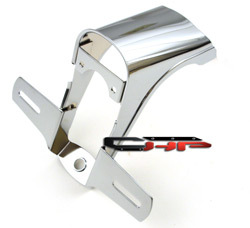 Heavy duty Headlight Bracket, billet aluminum. 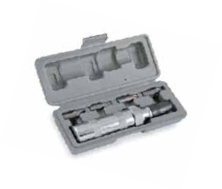 Clamp opening allows forks from 26mm up to 30mm. Swivel pivot point mounting for headlight assy. 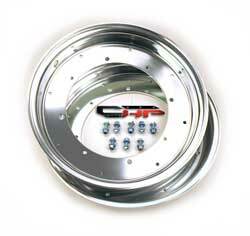 CHP 12" Aluminum Rim SET, 12 x 350both front and rear wheel rims set included in this price and kit. Aluminum rims for the stock CT70 hubs. 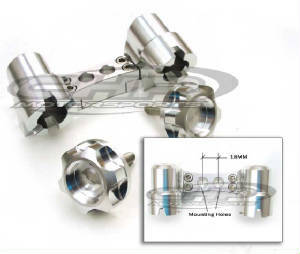 Kit includes all of the hardware to bolt your rim halves together, not including the hardware for bolting rims to hubs. 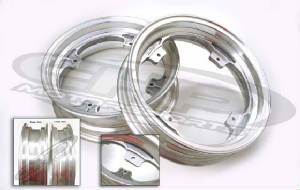 Aluminum ONE-PIECE rim set. Cast aluminum, 12 inch , machined to precise dimensions. This one-piece rim set bolt directly to your stock CT70 hub. 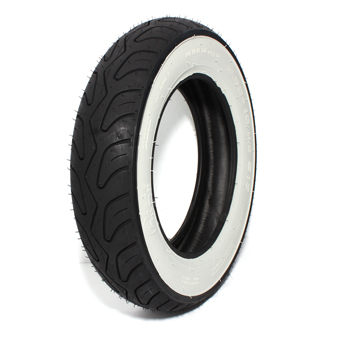 Front rim is 2.75" (stock size) and the Rear rim is 3.50" wide for a staggered performance stance. 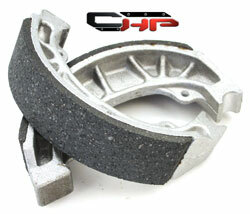 Really nice dress up piece, heavy duty construction and no worries about splitting rims sets any longer or rust. 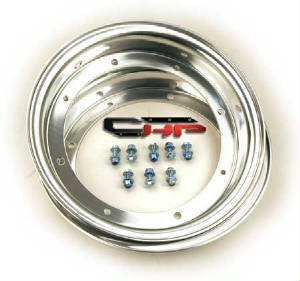 CHP 10" Aluminum Rim SET, 10 x 350both front and rear wheel rims set included in this price and kit. Aluminum rims for the stock CT70 hubs. Kit includes all of the hardware to bolt your rim halves together, not including the hardware for bolting rims to hubs. Fits 12" rims. 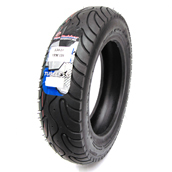 Aggressive tire tread design, 4-ply rated nylon carcass. 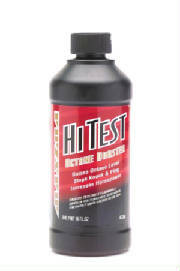 Very good adhesion compound for aggressive street riding or performance riding. Speed rating J (62 MPH). 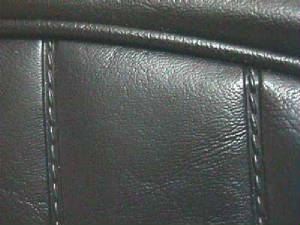 CHP Complete Seat, reproduction. 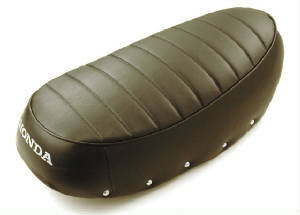 The only seat cover and seat on the market that has all of the correct features, pleating design, pleat spacing, stenciling of the HONDA name, as well as HEAVY duty cover, manufactured from the heaviest gauge vinyl available for long life and durability. CT70 K1 TO 1979 complete seat. A nice sample of a reproduction seat that is ready to bolt on your bike and go. 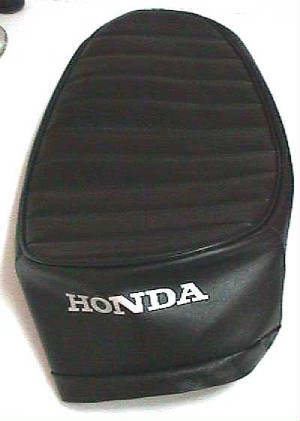 Heat pressed seat cover with the similar design to the original seat from K1 through K3 but the over-all shape of the seat looks like the seats all of the way up to the 1979 model bikes. 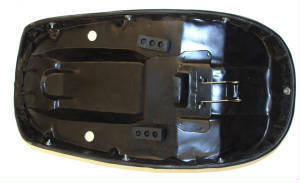 Stamped seat pan as well as the metal trim piece along the bottom of the seat. 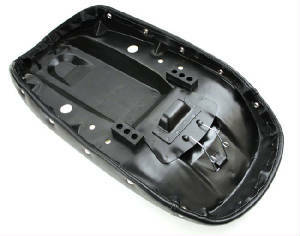 Nice tight fit between the cover and the foam with heavy duty foam designed for the adult rider. This seat is essentially hand made and virtually all of the pieces of this unit are hand made so there are some irregularities with the stamping of the seat pan and the hand made stainless steel trim piece around the seat but still a very nice piece and I do not think that this seat quality can be matched for the price anywhere. As always we try to be completely honest with a description of all of the parts that we sell on our web site, as we are after satisfied customers. Shifter, CHP Off-Set more than 3/4" and just over 4" in length. This shifter has a longer clasp so that the anchor point to the shift spindle is off-set and moves the sifter out away from the flywheel cover. Heavy duty steel construction. 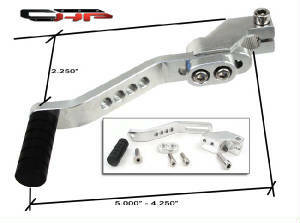 Shifter, Billet Aluminum adjustable with 2.125" offset. 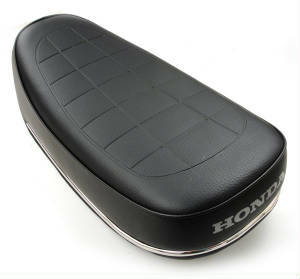 This shifter is a very high quality piece that can be adjusted to fit almost anyone's foot or shifter length. 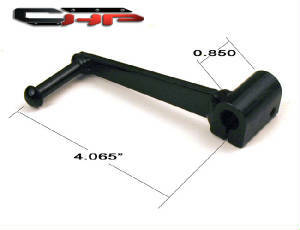 Adjustable from 5" to 4.125" in length as well as having a 2.125" offset to clear almost and motor configuration. 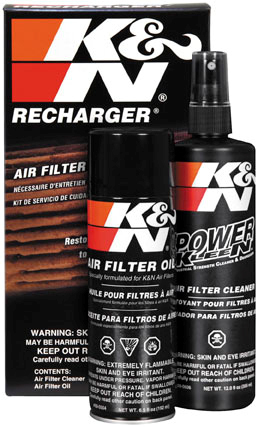 • Kit contains 6-1/2 oz. spray oil, 12 oz. Copyright © 2000-2014 MX-PERFORMANCE.COM LLC. All Rights Reserved. Product Specs, Pricing, and Availablity subject to change without notice.